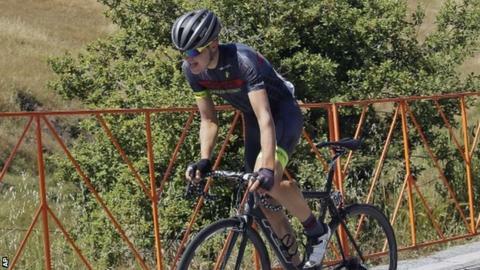 Mark Cavendish lost the overall lead in the Tour of California after Tuesday's hilly third stage around San Jose. The British sprinter, who had won the first two flatter stages, had not been expected to retain the lead and duly finished 21 minutes behind the winner. Latvia's Toms Skujins, of the Hincapie Racing Team, overcame a minor crash and headwind on the final climb of the day to claim victory and the race lead. He leads Peter Sagan of the Tinkoff-Saxo team by 32 seconds. "The last half hour was pure pain," Skujins said. "In the headwinds I was just dying," he said. "It is easier to win solo because then you don't have to sprint. I had nothing left."